Summary This project consists of two applications of the Blue Sun system, developed by Stork, which generate heat and electricity from solar power simultaneously. The standard model Blue Sun is provided with four solar panels that generate electricity and a solar thermal collector that takes care of the heat production. The integration of the system on the roof has much influence on the construction and the waterproofness of the roof. As this experimental project showed, the system is with good results. Further development followed. The Blue Sun system is applied in a new housing estate in Vaassen. The total system consists of six solar thermal collectors (23 m²) and 111 solar panels (9.7 kWp). 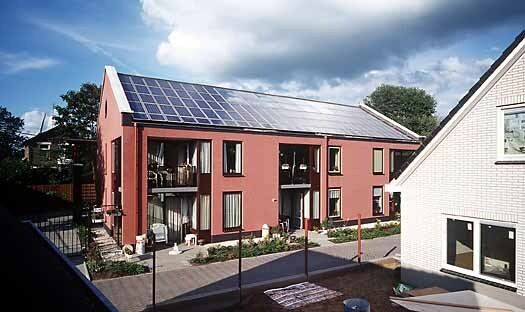 In Bodegraven, seven standard Blue Sun systems are integrated in existing roofs. This system consists of seven solar thermal collectors (27 m²) and 28 solar panels (2.7 kWp) in total.